When you get to be a an adult, you have usually seen enough to play a few rounds of the “Where were you when” game. I’m not quite old enough for the assassination of President Kennedy, but I do have plenty of others: Reagan was shot. The Challenger explosion. The Berlin wall comes down. The Oklahoma City bombing. The Southeast Asia tsunami. And when you live in Moore, Oklahoma, certain dates need no explanation: May 3, 1999. May 8, 2003. May 20, 2013. When you live in Moore, you talk about those dates as if they are physical objects or something more than a date on the calendar. “The May 3rd came five blocks from my house.” “The May 8th knocked my power out for three days.” We don’t even use the “T” word. Don’t need to. I’m sure May 20th will enter our lexicon in the same manner. 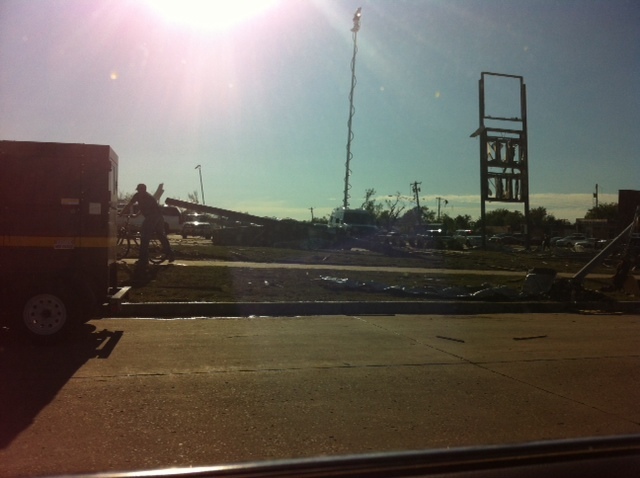 The Warren Theatre in Moore after the May 20 tornado. Photo by Nicole Courtney. On May 3, 1999, I was five months pregnant with my now-13-year-old son. On May 8, 2003, he was at his daycare, very far away from the path of the tornado. On May 20, 2013, he was at a middle school about half a mile north of where the tornado came through. I knew he was okay. 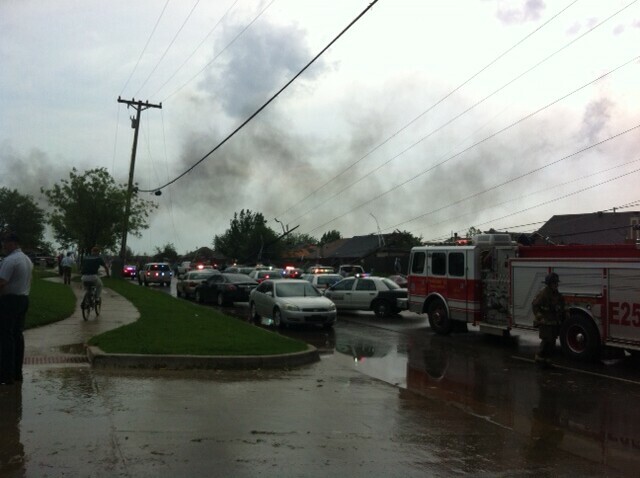 On May 20, my 5-year-old was at his daycare/private school on Southwest 149th and Santa Fe in Moore. If you look on a map, it’s right between the Orr Family Farm and Briarwood Elementary School, directly in the path of the tornado. I was downtown at the First National Center watching it on TV, knowing where it was heading and not able to do anything about it. As a parent, there is no worse feeling in the world. When my husband and a dear friend, who parked and ran a mile in the rain and mud to get to his school, sent texts saying he was okay, I burst into tears. Pure, sweet relief. The daycare center and school Colleen’s son attends. Confusion and chaos have now turned into a mixture of sadness and tenacity. 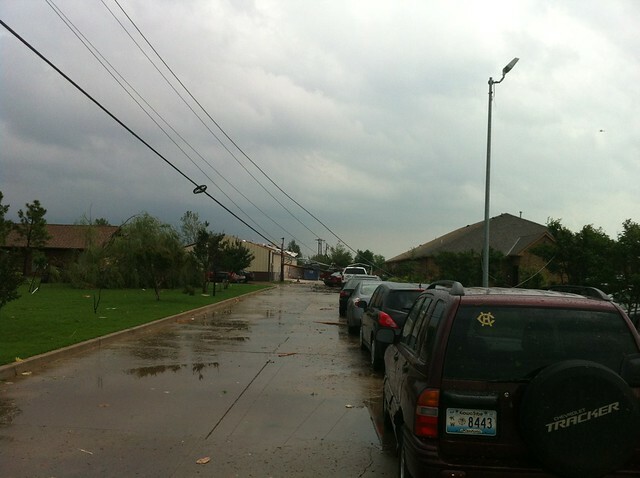 Most homes in Moore got power and water back within 24 hours. But right after it passed and rescue began, everyone on my street was out front. Sharing snacks and water bottles. Sharing battery-powered cell phone chargers. Listening to car radios to find out what was going on. Watching helicopters circle overhead. Wondering what the extent of the damage was. Crying over the losses at Plaza Towers Elementary. Singing the praises of the teachers at that school and Briarwood, true heroes of the day. Hugging each other. The Moore Warren IMAX theatre from I-35. Photo by Nicole Courtney. Yesterday I drove up Telephone Road between 19th and 4th Streets. It was devastating. I’ve driven that road a million times, and my mind knows what it’s supposed to look like. And I almost couldn’t comprehend what I wasn’t seeing. The bowling alley, where my 13-year-old had his fifth birthday party, is gone. The room in Moore Medical Center where my youngest was born, gone. The 7-Eleven where I stopped many times and just bought Icees for my kids on Saturday, gone. Streets lined with homes that are no longer there. In my front yard I found a piece of a floor, a wall, and one page from a book. Who knows if they all came from the same house? 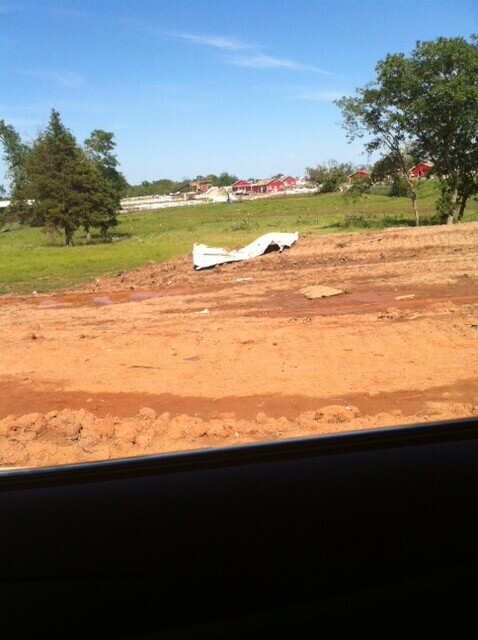 The Orr Family Farm on South Western, which was destroyed by the tornado. Photo by Colleen McIntyre. The world has descended on Moore. I’ve seen media trucks from all over the country here. NBC did a special hour-long report from here. I’ve seen police from Ponca City, El Reno, and Enid. I know there are more. First responders in Moore. Photo by Colleen McIntyre. Three days later, the normal sounds of spring birds and children’s laughter are interrupted by helicopters overhead and sirens blaring up and down the streets. It’s the new normal for us right now. The shock is starting to wear off. Everyone’s focus is now turning to those we know have lost their homes and helping in any way we can. Makeshift unofficial donation spots have sprung up all along 4th Street between Telephone Road and Santa Fe—just regular citizens who are putting out stuff that people can come get if they need it: diapers, shoes, water, food. 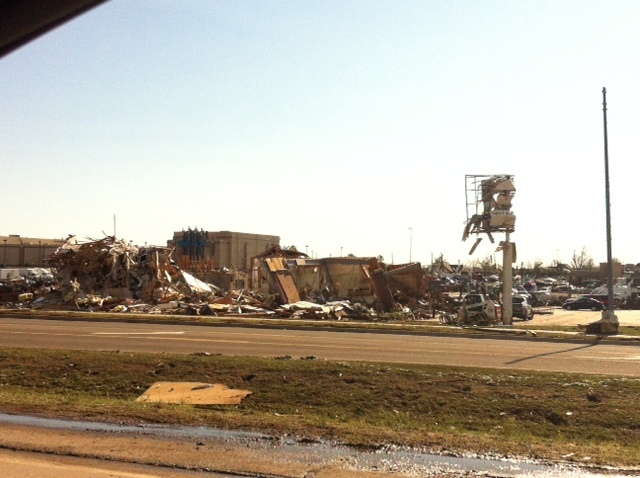 What remains of the 7-Eleven gas station at 4th and Telephone in Moore. Photo by Nicole Courtney. I’m sure the world wants to know why we continue to live here. We’ve been hit three times in the past fourteen years. But if you want to know the answer to that question, just look around. Beyond the rubble, you’ll see people picking up bricks, moving debris, handing out water. Moore is a community where people care about each other. We don’t live here because we have to. We live here because we want to. 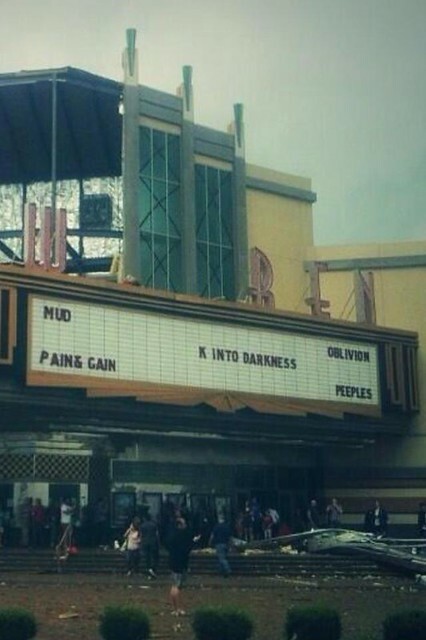 Because we know this place is strong, and you can always count on your neighbor.